Amateur photograph of SCP-XXXX, taken by J████ H██████. higher than -57°C. At least two (2) agents must be stationed on guard outside this room at all times. 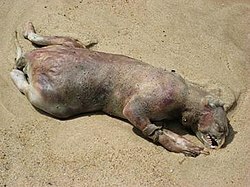 SCP-XXXX esists, however, SCP-XXXX is known colloquially as the "Montauk Monster" and "The Hound of Bonacville"
thus alive SCP-XXXX would be classified as Eucluid. [DATA EXPUNGED]. However, SCP-XXXX was produced, a "combination" (according to Dr. ██████) of the two (2) subjects. and dumped SCP-XXXX into the Atlantic Ocean. agents obtained SCP-XXXX, following a request by Director █████ of PIEDEC. this may be for you and your agents. [DATA EXPUNGED], and thus will request approval of all experiments involving [DATA EXPUNGED]. Thank you again. I am formally requesting permission to conduct an experiment involving [DATA EXPUNGED], using two subjects, a Homo sapien and an Equus ferus. replicate the previous experiment would be unwise, especially with a human subject.